Mangia Italiana occupies a small building in the quiet community of Irvington, Nebraska. Having won many local awards for their pizza, they have quite a reputation and a loyal following. Last Saturday evening, we met friends for beer and pizza on their outdoor patio. The restaurant is very small with only 6 or so tables tightly packed inside. A much more spacious patio is available for dining, if weather permits. Every time we’ve been there, the dining room has been full and there is usually bit of a line to order. You order right at the front counter, grab your drinks and take a number to your table. Tonight we were trying many different types of pizza: a pepperoni, a veggie, a Pizza Bianco, a meatball special, and a hamburger. 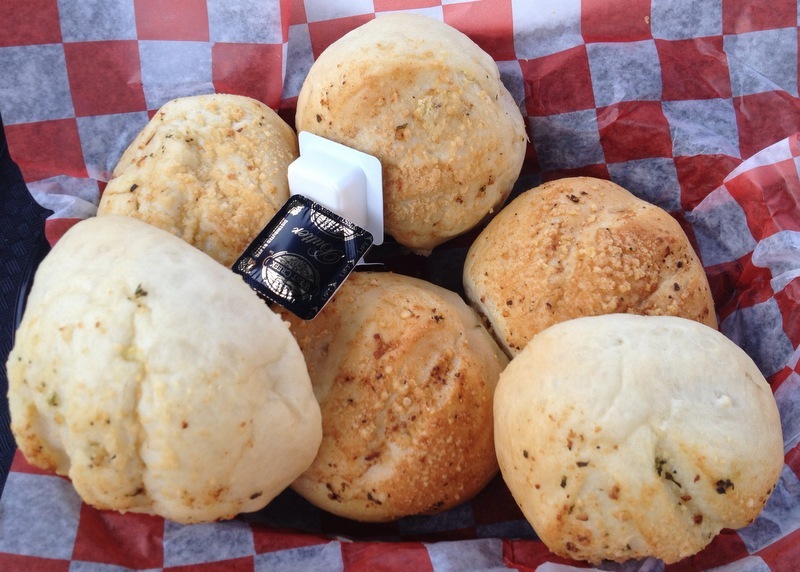 In addition to that, we ordered some parmesan rolls and a few cold beers. 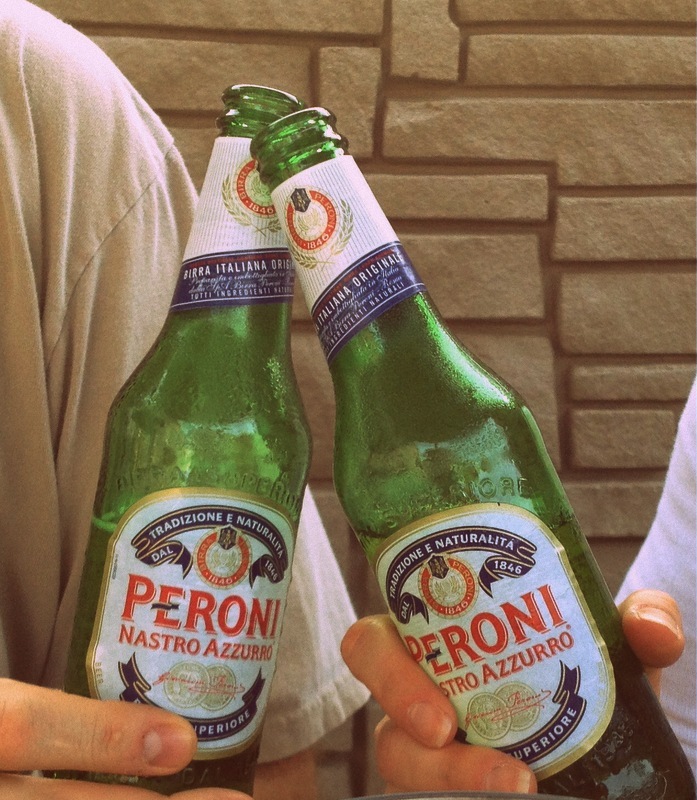 Peroni of course! 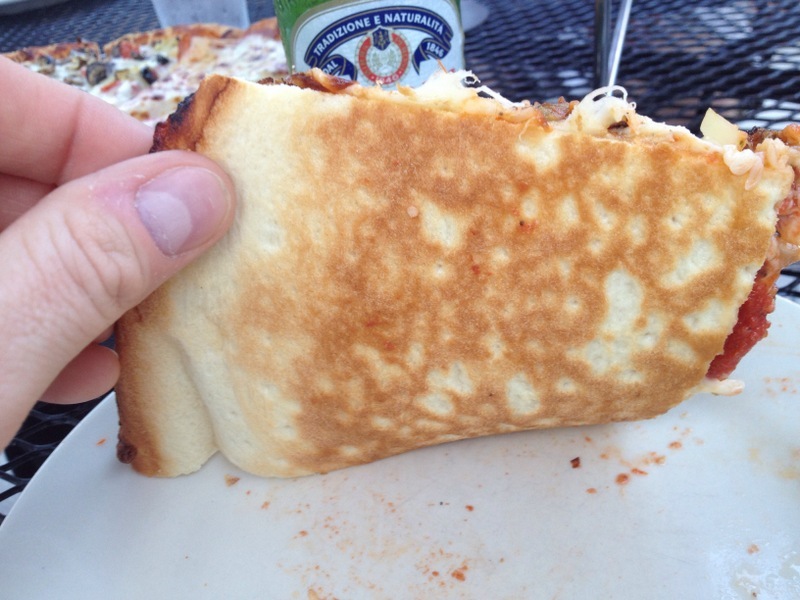 The crusts at Mangia are on the thicker side measuring nearly 3/8″ thick. Certainly much thicker than is our preference and very similar to the crust at Mama’s Pizza. The crust also reminded me of Valentino’s Pizza: filling. They use a dough docker to limit bubbles while cooking, and it would appear by the bottom of the crust that they cook their pies in a conveyor oven. The sauce at Mangia was extremely flavorful with a nice balance of sweet tomatoes, garlic and herbs. Delicious! All of the pies shared the same thick, dense, doughy base, well seasoned sauce, and herbs both above and below the generous toppings. Even with our dislike of the crust, all of the pizzas were quite tasty with quality toppings. The pepperoni pizza and the hamburger pizza were both good. Standard, but good. Mangia Meatball (left-ish) and white pizza (right). The meatball pizza is described on their menu page as “Our famous meatballs with onions on our pizza sauce with garlic butter crust.” Yum and yum. The meatball chunks have their own little herbal magic baked right in. Everything about this pizza was absolutely fantastic. Our other pizza contained half of the Pizza Bianco which features “Alfredo sauce with whole milk mozzarella, asiago, romano parmesean & provolone.” This pizza was simple and unique. The sauce was fantastic, and the blend of cheeses on top were again delicious. If you like cheese pizza, you’ll love this. You can also get this with grilled chicken! The veggie pizza had an abundance of fresh toppings, such as tomato, artichoke hearts (The Pizza Wife loves the tang! ), red onion, fresh mushrooms and minimal black olives. Combined with the fresh sauce and melty cheese, The Wife thought it was a symphony of flavor that has been unmatched in our pizza tasting thus far. Overall we really enjoyed our night out on the patio with our friends, cold beer and some outstanding pizza. 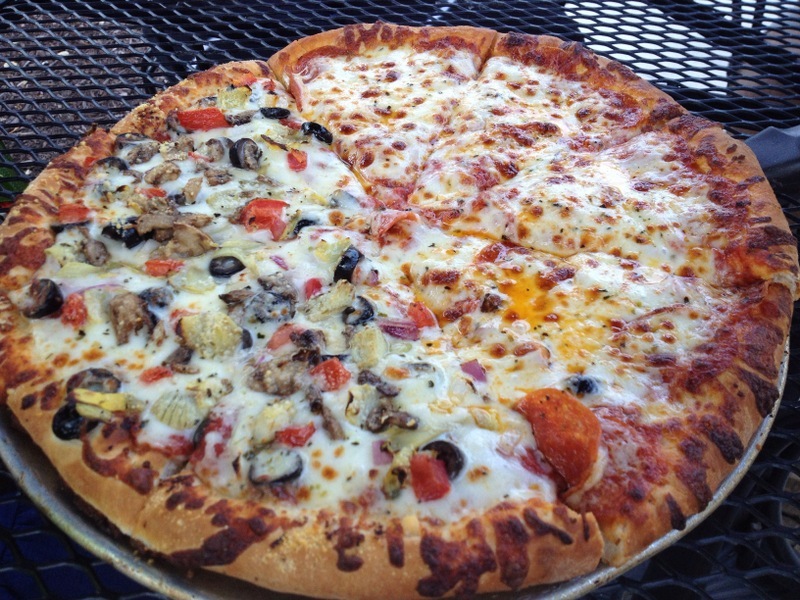 The flavorful and bountiful toppings almost made us forget about the thick and doughy crust. Almost. I’ve said it before and I’ll say it again, we are clearly in the minority. Omaha really likes a thicker crust. We, on the other hand, enjoy the thinner and crispier crusts. To each their own. Our job is to eat and report, and eat and report we will! The bad: thick, dense and very filling crust. 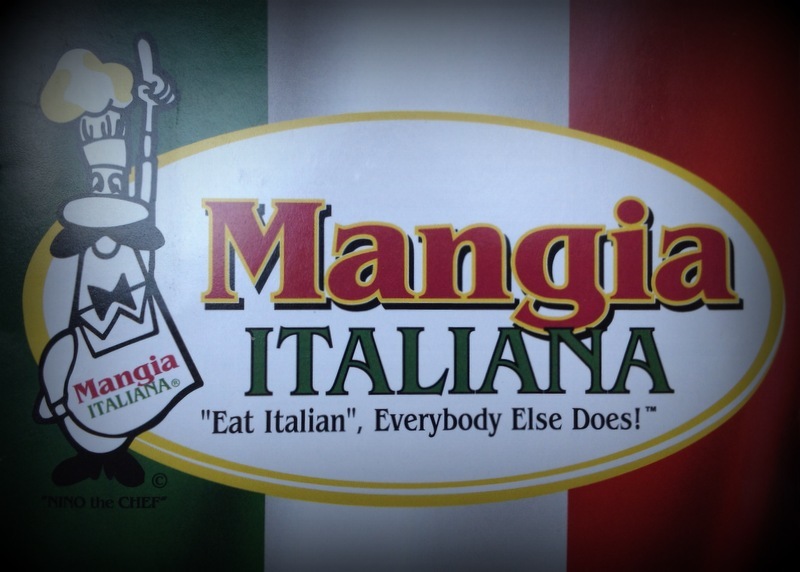 How would you rate Mangia Italiana’s Pizza? Click on the stars below! This entry was posted in Pizza and tagged Mangia Italiana. Bookmark the permalink. 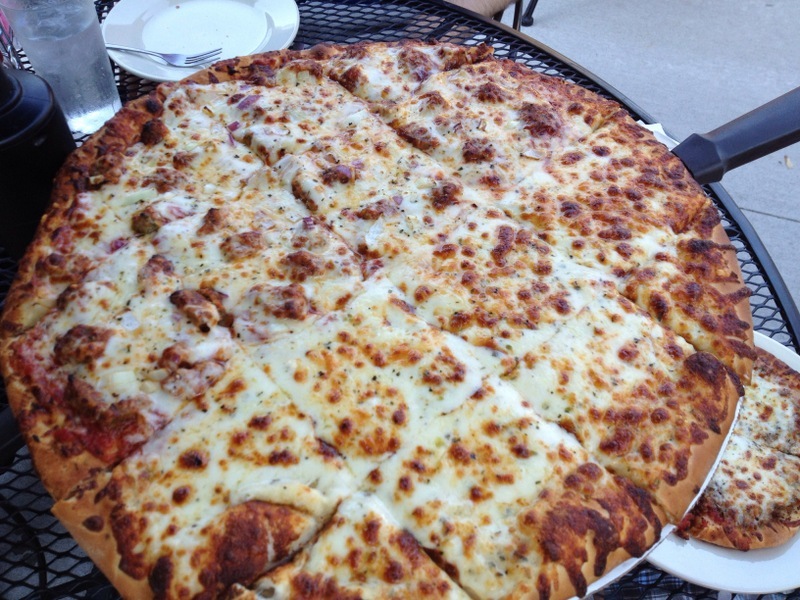 This is the only thick crust pizza I like. Favorite is the buffalo chicken. OH my gosh..You have to eat here! We’ve tried almost all the pizzas that they have and they are amazing. Oh and try the spaghetti with red meat sauce. Its the best I’ve ever had!